The brand new multifunction digital relay CRM-100, which belongs to thetime relays category, finds its use in controlling the diverse devices of your household. It can handle light or heating control, it can also be used to control motors or pumps. What’s new for you? 17 functions - 4 time functions controlled by the supply voltage and 13 functions controlled by the control contact. Thanks to the digital display and settings you have the time set without any mechanical tolerance. The digital display ensures a clear view of the time function. Time range 0.1 s - 999 hours. 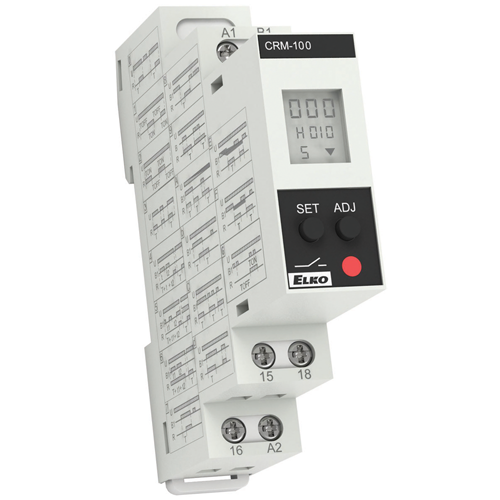 The CRM-100 is designed for DIN rail mounting. Find more about CRM-100 on this product page.